I'm sure that you have noticed in the various photos depicting myself while outdoors and involved in various activities, that I am wearing knee pads. You may have wondered why I wear them. Well I'm here to tell you that knee pads are effectively one of the most overlooked pieces of kit you can wear while involved in outdoor activities of any kind. An unfortunate side effect of being involved in strenuous activities is the eventual wear and tear on your joints, and when you are low to the ground daily, whether it be while involved in activities related to anything where your using your knees , you are going to stress your knees. The best knee pads need to be able to first off protect your knees, everyone knows that, but protection from what is the question. This can be from the ground, or simply stay comfortable when taking a knee for an extended period. Knee pads need to be comfortable, and need to be durable. When protection, comfort, and durability come together you have a pair of knee pads worth trusting your knees with. Knee pads can be found in almost every big box store, but unless your laying floors or working in the yard, I prefer the more tactical style of knee pad such as the ones that I am wearing in the photo. I have tried various types of knee pads, and they are not all created equal, as they can be a pain in the ---, especially if they have a poor means of attaching them to your legs, and you spend all your time pulling them back into position. The best style of kneepad can be easily found in paintball outlets or on the Internet if you don't have a paintball outlet near you. I have also seen the true military type of kneepad in army surplus outlets, however be prepared to pay more money for the true military type kneepads. Another piece of kit that you will want in your bag of tricks are gaiters like the ones I'm wearing on my lower legs. The ones you see here are built with durable, waterproof Gore-Tex uppers, and an abrasion-resistant packcloth lowers. These particular gaiters use a durable Hypalon instep strap, with reinforced boot lace hooks, and double stitched hook/loop front closures. Amongst other things, gaiters keep snow, rocks and trail debris out of your boots, and they also shield from water when fording streams or facing precipitation. On this day, having set out just after sunrise, with the grass laden with heavy dew, my pant legs would have been soaked through in the first 50 feet after leaving my truck behind. Gaiters are also a protection against being bitten by venomous snakes, possibly while in badland terrain, home to the Prairie Rattlesnake who when threated will almost always strike the lower leg. 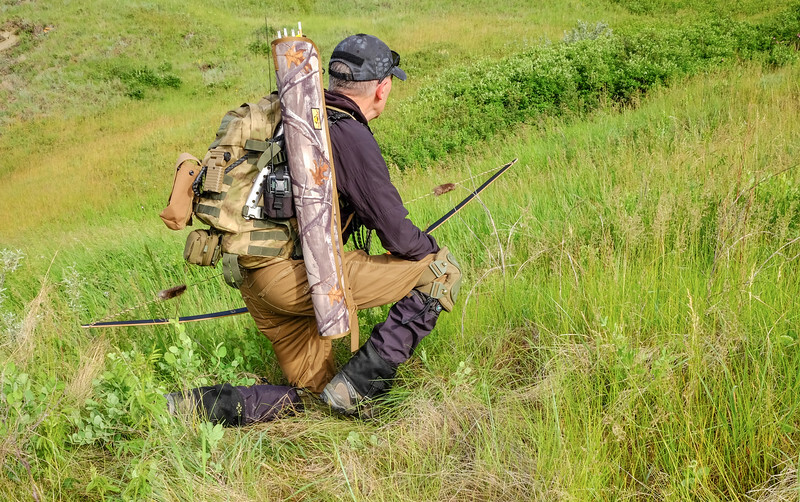 Gaiters are also great for keeping Ticks from biting your legs beneath your pant legs while moving through tall grass.